Mi-Carême is not only uniquely a Catholic holiday, it appears to be uniquely a French Catholic holiday, which makes perfect sense, since the French never go more than six weeks without a major school break, and not even more than two full days in a row of school (Wednesday is either a day off or a half day). I wonder what would happen if the thing that a French person gave up for Lent was taking so many vacation days? Would they still take a Mi-Carême break from their break from breaks in the middle of Lent? It's like contemplating the beginning of time or the end of space. In fact, the only other reference to Mid-Lent celebrations I can find are in Eastern Canada -- no doubt a holdover from French settlers. There, the tradition also includes bringing candy to children. It really is springtime Halloween. 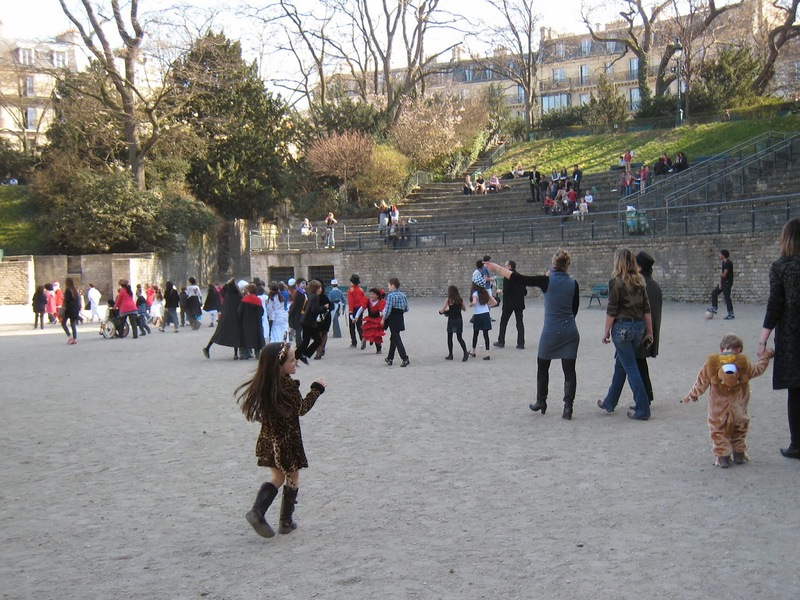 For their first-ever Mi-Carême, our girls dress up and parade through the fifth arrondissement with their classmates up to the Arène de Lutèce, an honest-to-goodness two-thousand year old Roman arena in the heart of Paris. What I love most about this arena is that it's practically hidden from the street and that it had been lost and covered for centuries before being rediscovered in the 1860s. Every time I walk in, I feel like I'm making an important archeological discovery. Me and the old guys playing pétanque (French bocce), that is. 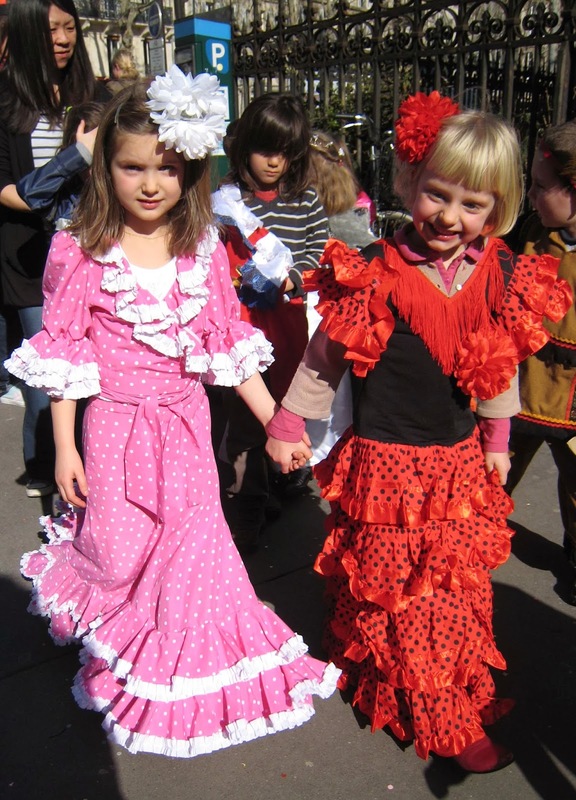 I had hoped that the choice of Mi-Carême costumes would be more culturally enlightening, but, in fact, it is somewhat similar to what a group of American children would be wearing at Halloween. 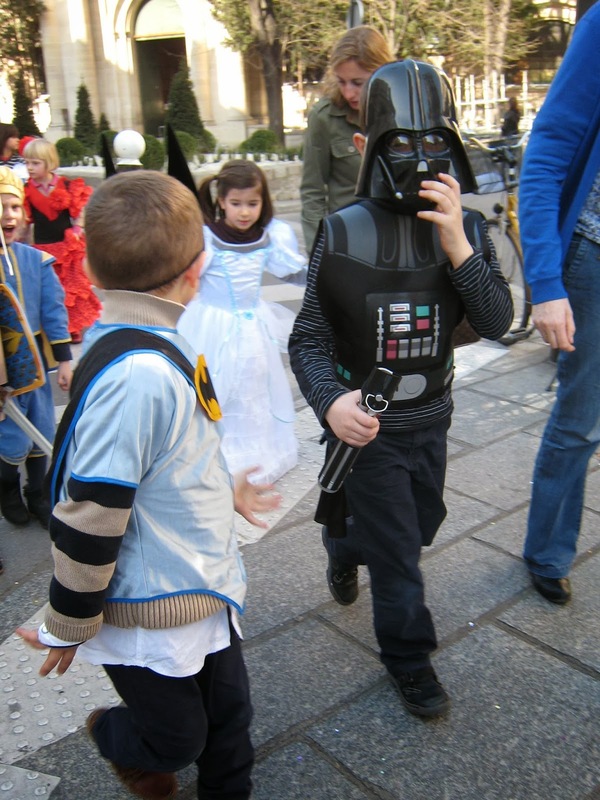 There are plenty of princesses, pirates, Indians, and Batman and Star Wars characters. About half of the really little boys are Spiderman (pronounced "Speedermon"). On the other hand, there is a far higher percentage of flamenco dresses here than I'm used to seeing. 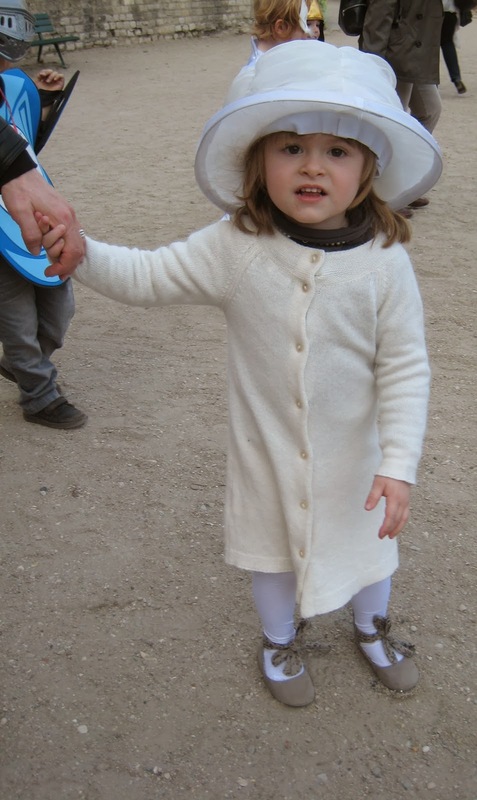 There are also a few young girls -- bless their hearts -- dressed in non-princess clothing: a Zorro, a firefighter, and one mini Queen of England (at least it's not a princess). And as they get older, they seem to be branching out more. Gigi enjoys the "bad boy rocker" costume of this sweet kid but, of course, has no real idea how appealing this will be to her in about six years.... Quite appropriately, one of the class clowns dresses up as Charlie Chaplain, who is possibly more famous and beloved in France than in the States. And then we have Pippa and Gigi themselves. Their first year here, during Gladiator Lent-o-Ween, Pippa is a cheetah, and Gigi is dressed in an authentic sari bought on a trip to India. It looks fabulous, and by God, I'm beginning to think there is no occasion at which you can't wear a sari. Though there's no trick-or-treating, it's far from sugar-free. In typical French fashion, when the snacks are put out at the post-parade party, the tables are laden with chocolaty carbohydrates and nothing else. If you've been reading the blog regularly, this will not come as a shock to you. There is no pretense at putting out fresh fruit and hoping the kids will take some. I hope you're in the mood for a jam crêpe, a puff pastry with chocolate flakes, or a nutella covered waffle, all washed down with a Smurf-colored drink that appears to be made of two ingredients -- sugar and artificial FD&C dye Blue No. 1, E133. If you speak French, a Tomme Mi-Vache Mi-Chèvre ﻿is quite self-explanatory: The name is Half-Cow Half-Goat, and the cheese is the same. The crust is dry and dusty, but still edible. It puts off several of the Americans at the table, but I eat it, and enjoy it, and I think the others start to follow suit. The cheese itself is something of a surprise; I don't know why, but I expect a generic hard cheese named after its animals to be something less than exciting. But it's delicious, in fact. Tangy, moist, and just as earthy as it looks. For a story on Mi-Carême, a cheese that's Mi-Chèvre and Mi-Vache. It's a mi-diocre connection. At least the crust does look rather like a 2000 year old weathered stone in the Arène de Lutèce.